Canare L-4E6S Microphone and Audio Line Cable is the PREMIER Star Quad cable for all hand held microphone applications. Flexible, satin smooth to the touch, and extra strong, this standard diameter 21 AWG cable fits perfectly in all XLR-type audio connectors. 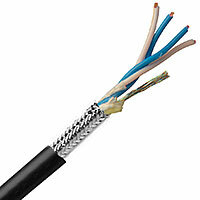 40 separate strands in each conductor eliminate breakage due to flexing. Star Quad configuration eliminates handling noise and rejects EMI and RFI. Perfect for all Microphone, Audio Rack Wiring, PA System and Audio Patch Cord use in portable applications. Conductor: 21 AWG, 40 strand (x4) Copper conductors for flexibility and expanded frequency response. FOR CUTS : 50 Minimum for single channel cable.